Looking for a lost friend or family member? Looking for information on the squadron? Then you are in the right place. The quickest response is to post a message in the briefing room but if you would rather, you can send an EMAIL with your message or question and I will have it immediately posted here. If you are reading the posts and think you may have information that can help someone, please take the time to do so. NOTE: The construction of the site is temporarily on hold due to personal matters which have made extreme demands on me this past year and have required my undivided attention. The site remains a love and a passion but it requires a tremendous amount of time to maintain and this is a commodity I have had precious little of these days. I sincerely appologize to all those who have been waiting to see updates to the site but I am confident that things will return to normal in the near future and I can once again devote my attention to this great project. NOTE: Although the deadline is passed, it would be worth contacting these folks so that anyone missed can be included in future releases. I regret to inform everyone that LAC Eddie Lowe passed away Sunday 20th December 2009. Eddie's daughter in law, Paula Clarke said that Eddie passed away peacefully at Trafford General Hospital after battling repeated infections. Tragically his wife Maria predeceassed him only months earlier on the 27th July 2009 and understandably would have had a profound effect on Eddie's health. He will be sadly missed by his family and friends. NOTICE: No 214 SQUADRON MEMORIAL DEDICATION A new memorial to No 214 Squadron will be unveiled at the National Memorial Arboretum at Alrewas, Staffordshire on Saturday 18 July 2009. All former members of the Squadron and their families are invited. For further information visit www.214squadron.org.uk or contact No 214 Squadron Association through: John Gulliver, Chuckyâ™s, Swains Lane , BEMBRIDGE, Isle of Wight , PO35 5ST , e-mail j-gulli@supanet.com. A warm welcome back to the squadron after 68 years goes out to LAC Fred (Eddie) Lowe, Armourer 1939 to ?. Updated LAC Lowe profile but much more to follow. Added Sgt Joseph Douglas Woodcock to personnel section, a warm and long overdue welcome to Rhian, Dawn, Joanna, Daniel and the rest of the family. Congratulations go out to Daniel who has recently taken a commission with the RCAF. (Canadian Forces Air Command). Sadly Sgt Woodcock passed away on the 23 of November 2007. Daniel has gone over the log book with his grandfather and hopefully we can get together at some point to go over this. A warm welcome from the 113 Friends & Families to the Aitken family. Helena Alexandra Aitken from Edinburgh has been kind enough to forward photos of W/O John (Jack) Aitken which have been added to his section in personnel. A warm welcome from the 113 Friends & Families to the Chapman family. The long search is over, the son and grandson of F/O John Chapman, both also named John Chapman, have been in contact and provided a great autobiography and some of the escapades of F/O John Chapman, one of the squadrons most colourfull characters. See his page in the Personnel Section and read about some of his escapades in the True Tall Tales section. Added info on Ketton-Cremer, Ken York, Sgt Thomas Crowe, P/O Powning. Sgt Jack Curtis, Sgt Errol Wright, Cpl Arthur Fairclough, Corp George 'Ronnie' Evans, P/O Bernard Kitchen, S/Ldr Ivor Beeston, Flt/Lt John Barry (Nobby) Noble, F/Sgt Mike ffoliett Foster, Sgt Bagguley, L AC Corner, ACH Harding, ACH Jones, Lac Eddie Lowe, LAC Jim Oliver, P/O Phillip Williams, Bomb details - Hinds Section, Palel India Airstrip and numerous small additions. Note that many belated notices have been backdated to the bulletin board by the date actually received. Would anyone having further information on 527339 Sgt T.A.R.Crowe who was killed in a crash in the UK on 08/03/1942 please contact Howell Davies. He can be reached by applying to this site for his email address. The CWGC states that Sgt Crowe was with the 113 Squadron at the time of his death but Howell has provided new information which makes it apparent the CWGC is in error. Howell states that at the time of Sgt Crowes death he was a pupil at No. 53 O.T.U. based at Llandow, Glamorgan S. Wales. That Sunday morning (08/03/1942), he took off from Llandow in Mk 1 Spitfire, serial number L1014 to carry out a training exercise. At 1035 hrs he crashed into the Holy Mountain approximately 2-miles NNE of Abergavenny, Monmouthshire. Sgt Crowes entry in the Personnel Section has full details. Great news to all in the event you have not read the latest post in the Briefing Room. A warm welcome from the 113 Friends & Families to Nick Barnard who has contacted the site and has in his possession the log books and diaries of F/Sgt Mike ffoliett Foster. (a.k.a Tex) Nick has kindly offered to write up a biography on Mike for the 'Personnel Section' and discussions are underway as to the best way to digitize these records so that they can be preserved and added to the various appropriate sections in due course. Numerous updates and additions to various spots on the site covering most all sections. Many belated notices to this Bulletin Board have been added. The most significant of these is the death of F/Sgt Ewan Brooking and Corp Wilfred Archer. (See below) The briefing room was reopened but modified so that Guests can no longer post, you must sign in first. Hopefully this will reduce the spam postings we were getting swamped with. Also caught up on long overdue emails to the site so if you have not received a reply please, please contact the site again. A warm welcome to David Evans, son of Corp George 'Ronnie' Evans. David commented his dad was a 113 man through and through. Corp Evans served on the squadron through Greece, Africa, India and Burma, 04/03/1941 to 11/04/1944. A warm welcome to Paul Kitchen of Tasmania. Paul is the son of P/O Bernard Kitchen who served on the Squadron as a Blenheim Pilot and was one of the few Squadron pilots who retrained on Hurricanes and stayed with the squadron through the conversion from Blenheims to Hurricanes. Sgt Archer was born at Gateforth near Selby, West Yorkshire in 1918 in a farming family but decided to leave and joined the RAF in 1936 -37. Here he trained as a airframe fitter and is presumed to have been posted abroad when the war broke out. Like many veterans, little is known of his service years as he seldom spoke of them. It is known for certain he was with the squadron from 1941 to 1943 but very likely he had been with them from the beginning having gone over with them from Grantham UK to Heliopolis Egypt. 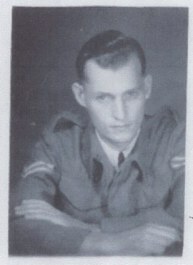 The picture shown above indicates that at some point he was awarded the coveted Sgt stripes. A warm welcome to Mark Annett, nephew of S/Ldr Ivor Beeston. Mark has kindly provided some further information on S/Ldr Beeston and hopefully there will be more to come. 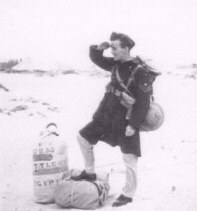 Ivor Beeston posted into the squadron with his crew to replace S/Ldr Cliff Harper after he disappeared. With the heaviest of heart and profound sadness, I regret to report that F/Sgt Ewan Brooking passed away on February 7, 2007. His sons Craig and Bryan passed along the grim news that he had suffered a sudden heart attack and stroke on January 31st, his 85th birthday. Typical of their fathers thoughtfulness and friendship, I quote an excerpt from their email: " Dad was so pleased to be part of the 113 web site and it gave him a real incentive to write out his Chapters that recorded some of his memories of his time with 113. His funeral is on February 13th here in Hawks Nest, and we will have the NZ flag on his coffin together with a picture of him in uniform as well as his war medals". Both Craig and Bryan have vowed to pick up the torch and carry on where their dad left off, indeed they already have. As many of you know, Ewan is a co-founder of the the site and I can say, without exaggeration, he single handedly advanced this project years ahead of where it would otherwise have been. He was a tireless advocate of this project and I very much enjoyed working with him. The volume of research, writings, photographs and data he contributed was so overwhelming it will likely be well into next year before it can all be processed and added to the site. Ewan and his pal Sgt.Harry Duignan, both observers (Nav/B) of the Royal New Zealand Air Force were posted to 113 Squadron R.A.F. on 10/03/1941 from the Middle East Pool at Geneifa. He would end up staying with the squadron nearly three years before posting out on December 29, 1943 after completing 37 operational sorties. No small feat recalling that the 113 Squadron fought with outdated equipment against every nation of the axis, in the worst theaters of the war, and under the most horrific conditions imaginable. After leaving the 113 he then went on to complete another 22 ops in the South Pacific before being repatriated home. It is no irony he devoted the 'best years' of his life for us all, and the 'last years' of his life that those who never made it home might never be forgotten. It is who he was. We are all indebted to you Ewan, you will be sorely missed. Goodbye my friend. A warm welcome to Peter Noble, son of Flt/Lt John Barry (Nobby) Noble. F/Lt Noble was a 113 Squadron Hurricane Pilot from 1943 to 1944. Peter still has his fathers mug from the 113 mess. A warm welcome to Mark Fairclough, son of Cpl Arthur Fairclough. Nothing of Cpl Fairclough's service years are known yet but Mark has found a treasure of photos & such his mother saved which he will be scanning. Hopefully we will see these soon. A sincere appology is also in order, Mark had contacted the site in January but it was not untill July his email was discovered buried in the site mailbox. It is with deep sadness I regret to inform everyone that F/Lt Bill Whittlesey passed away on November 7, 2006. Bill enlisted in the RAF 25/04/34 and started with 113 Squadron "B Flight" as an AC2 at Heliopolis and was promoted to Corporal shortly thereafter. In all, Bill served with the RAF 11 years, from nearly the dawn of modern aviation, through it's frantic prewar buildup and throughout the entire Second World war. See F/Sgt Whittlesey's profile in the Personnel Section and his many excellent photographs in the Photo Recon section. Special thanks from all of us to Martin Carter for his research and great help with this project. Added two GOOGLE "search engines". These can be found mid-way down on the Welcome page. *One searches "the entire internet" without leaving the 113 Squadron site, this is handy if you are researching / reading something in here and you want to check on something. EX: you are reading an article and come across a place you are not familiar with and want to find out where it is without loosing the page you are reading here. *The other searches only the 113squadron web site, this is handy if you are say trying to find specific information such as an aircraft serial number, or perhaps every place in here that someones name is listed. Setting up Corp Stan Harrison with deepest gratitude to Jim Newton, Eng Dept., Lancaster University. Jim who regularly visits Stan has worked tirelessly to capture and write his story, as well as scan a huge collection of photos and documents. Finished setting up Sgt Cyril Law profile, with special thanks to Sgt Richard White, Royal Marines for bringing Cyril to us and scanning and copying photos. Also added new material to Squadron story and photo section. Finished setting up profiles for F/O (F/Lt) Colin Ellis, W/O Bernard Allen, Lt William Woods RFC, Corp Jack Moore and numerous adjustments to the site throughout September. Corp (S/Ldr) Ian Blair Armourer /AG 'B Flight' is looking for any squadron personnel who witnessed the event of the Blenheim making its landing at Ma'aten Bagush at the hands of the "observer" on the 4th Sept 1940. The reader may recall this is the incident where pilot P/O "Mouse" Reynolds was shot and the Observer Corp Ian Blair brought the aircraft back and successfully landed it. Corp Hank Hankinson was the other crew member this flight. While any information regarding this incident would be appreciated, in particular Corp (S/Ldr) Blair would like to confirm the serial and squadron code number of the Blenheim. He believes the serial was L8347 AD-? but this serial does not show up in any records found to date. Note the serial he refers to L8347 does not show up in our records yet and does not seem to fit the serial pattern for the squadrons Blenheims on strength at this time, however the squadron had a Blenheim L8437 which is recorded in S/Ldr Keilys log for June 1940. Ironically Keily had LAC Hankinson up with him on this flight. Possibly L8437 is the correct number and seems to fit sequentially. Sqd Code is unknown but there is a photo of Corp (S/Ldr) Blair sitting on the Blenheim he flew back, and it has "The Old Un" painted on the front panel. This however "may be" that the photographer used whatever Blenheim was closest for the shot and that it is not the actual Blenheim in question. It is with great sadness to inform everyone that S/Ldr Clement John 'Bush' Barrey died suddenly on Monday the 29th of May 2006. Pete Flounders who visited Bush (as he was known to his friends) several times over the years while researching 60 Squadron, informed us of his passing in August. Bush joined the squadron in the desert in 1939 as an Observer and stayed untill December 1941, later wining a DFM and went on to become a pilot flying the latest fighter Jet aircraft and wining a DFC 'among many others'. He will be greatly missed. Thanks to Pete Flounders and others we have a wealth of material on Bush's escapades with the 113 that will be posted to the site in due course. Welcome and greetings to Roger Cannon. Roger's father F/Lt Geoff Cannon DFC, RAAF was Obs on the squadron throughout the summer of 1941 and flew with many pilots but his main pilot was Vic Cashmore RAAF. He stayed with the 113 untill October 1941 just prior to the it's being shipped off to Burma. If anyone out there recalls F/Lt Geoff Cannon DFC, Roger would like to speak with you. Please contact the site for his email address. 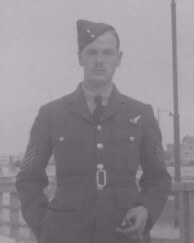 Corp Jimmy Lightbody, Ground Gunner, 113 Squadron Sept 1941 until July 1942. Posted to the 113 while on the Escarpment in the Desert, Jimmy fought against every enemy from the Germans and Italians during the great push against General Rommel to fighting the Japanese deep in the jungles of Burma. Jimmy passed away in April 2006 and he will be sadly missed. His experiences however, will remain forever for future generations to read and learn about this important era in our history. We all owe him a great debt for having the wisdom and taking the time to record his experiences. P/O (S/Ldr) Michael Shekletons incredible story of the Squadrons early days in the desert is now on the site. Note it is not complete or organized yet but you can read it as new chapters are posted. It can be read by finding your way to his spot in Personnel. NOTE: Most of those named above contacted the site long before the date indicated. A couple of months ago Peter Lewin from the UK sent me a photo showing several Blenheims in formation he had found in a book. 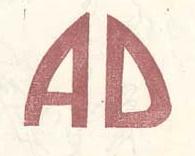 On the back was a note stating they were 113 Squadron aircraft enroute to Aden. This was a great mystery as of course it was well known that the squadron never served in Aden. I presumed it was a mistake untill, as fate would have it, P/O Michael Shekleton made a casual unsolicited remark about some Blenheims and Aden in one of his emails. Bingo! Another one and a million connection and it only goes to prove once again that one should never regard any information as unimportant, no matter how trivial it might seem. In this case the truth is stranger than fiction, read the whole funny story in Tall tales or the photo section. Surprise, but as it turns out, Sgt Ewan Brooking is also an artist and has sent through a couple of copies of his paintings for the site. These are extremely well done and highly detailed. One of his paintings is hung in the Auckland War Memorial Museum and more are hung at various museums in Australia and New Zealand. I hope to have copies of those he sent on the web site very soon. In an incredible stroke of luck I did a quick google search for the squadron doctor (Dr Joseph LaFrenais) that Corp George Foster and others had mentioned. The only search result that turned up was a fellow named Richard LaFrenais, so in a "one in a million long shot" I wrote him. He immediately replied, and although not related himself, was kind enough to pass my name along to another LaFrenais he knew. Shortly after I was contacted by Dr Lindsay Gething whose grandfather and Uncle both served in the war. BINGO! As it turned out, our Doctor was her Uncle and more than that, she had copies of his official reports to HQME. You can read these amazing reports at S/Ldr Dr. LaFrenais spot in the Personnel Section, it is an incredible story. Adam Such has sent through a photo he found of the squadron in his mothers things. Although she was not with the 113, she had been posted to Palestine as a Sergeant Clerk Special Duties in June 1946 and worked on Radar throughout the War, mostly on the Isle of Man. It is not known why she held the photo. It can be seen in the Post War Section of the site. Welcome to Peter Moore, son of Corporal John (Jack Moore). Peter is looking to find out more about his fathers service. 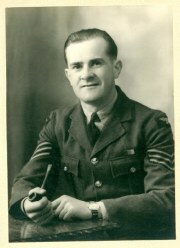 Corp Jack Moore served with 113(B) Sqn As a flight Rigger, 1935 A.C.2 up until 1938 when he was made LAC. Corporal 31/12/1944. Is also known to have been at 51 base 75 and 53 base. He died in April 1985. Would anyone who knew him or has further information please contact the site. 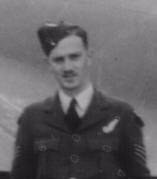 Dr Colin (Desmond) McLeish has been in contact with the site and is hoping to find any information on his Uncle Desmond Arthur McLeish, RAF aircraftman [1st Class] 641987. He was KIA with 113 Squadron on 19/08/1941. It is believed that Desmond was aboard T2113 Mk IV, in which the tail was damaged and broke off when it struck rocks recovering from a dive, it crashed into the sea near Ras el Kenayis Islands. If anyone has any information "at all" on Desmond would they please contact the site. It is with saddest of hearts I regret to inform everyone that Sgt George Checketts passed away October 17, 2005. A wonderfull man with a sense of humour and a keen witt, his valuable help in capturing the history of the 113 Squadron could not possibly be over stated. Once you had George started, the information poured forth in such volume it was impossible to keep up. Much of the Squadrons early history found here on the site was provided by George along with many rare photographs. Not surprisingly there is an equal amount yet to be processed. It was a great joy working with George and I personally will always cherish our long phone conversations, often about nothing in particular. It was through George that I saw a photo of my grandfather for the very first time. He will be profoundly missed by all who knew him.